Finally jumping ship, huh? For better or for worse, you’re not alone: If market reports are anything to go by, Android phones have carved out about three-quarters of BlackBerry’s market share in just a few years. Before you begin migrating your life from your BlackBerry to your new Android device, I’d like to review the main difference between BlackBerry and Android hardware. All BlackBerry devices have keyboards, but only some models have touchscreens; on Android it’s the opposite, with every Android device sporting a touchscreen but fewer and fewer coming equipped with keyboards. Although most people seem to have gotten used to typing on a touchscreen, I’m not one of them, and if you aren’t either you might want to look at our collection of the best smartphones with a full QWERTY keyboard for assistance in making a purchase. Now, moving on to software. First--and probably most important for a majority of BlackBerry users--you have to set up your email accounts on your new Android device. Google really wants you to use Gmail, and the majority of Android phones are designed to reflect this, with a friendly home-screen Gmail icon that needs only your username and password to be effectively configured. If you don’t already have a Gmail account for personal email, by all means make one--it’s a great service, and you’re going to need it anyway to sync your Outlook calendar. If you already have a Gmail account, you may want to consider persuading your IT department to forward all of your business mail to Gmail automatically; many companies balk at this notion because they’d rather not have their mail travel through Google’s servers, but the fact is that you could do a lot worse, and anybody who can arrange this option is rarely unhappy with it. If you decide not to go that route, you’ll have to use the alternate email application installed on Android phones. Depending on your version of Android, this application may be called 'Email' or 'Mail', but it’ll certainly be present; open your App Drawer (the scrolling list of all the apps that you have installed), and take a look. While the setup options for the Email app seem simple (and they actually are, if you’re using them to configure a common email address such as one from Yahoo), you’ll probably need some technical information from your IT folks to configure a corporate email server. If your office uses Outlook for mail on your desktop PCs, you likely have a Microsoft Exchange server. Microsoft provides some good, straightforward instructions for configuring Exchange email. The only information you’ll need that you might not have already is your email server name, and you should be able to find that information by clicking Help, About in Outlook and checking under the 'External POP Settings' line. If the setup process asks whether to use a secure connection and to accept any SSL certificates, it’s a good idea to say yes to both. Input the necessary information, finish the setup process, and you should be all set. 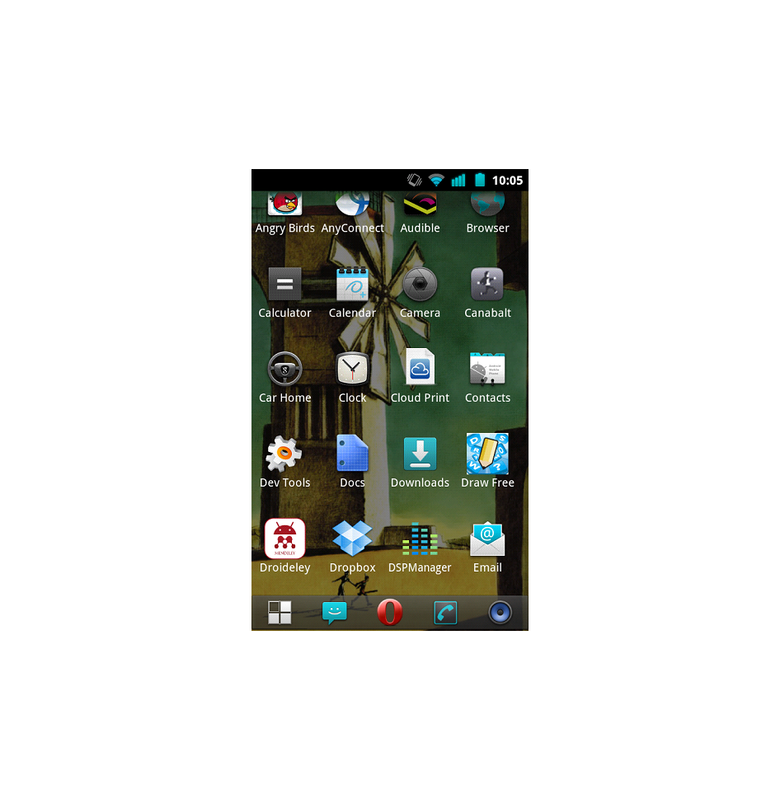 This screenshot shows the generic 'Email' app in the bottom-right corner of my App Drawer, with the App Drawer icon (unlabeled) in the bottom left. Next, you should import your contacts and calendars. The easiest way to do this is to go to http://m.google.com/sync on your BlackBerry device’s browser; this action will automatically install the software to begin syncing your contacts and calendars with Google’s cloud. 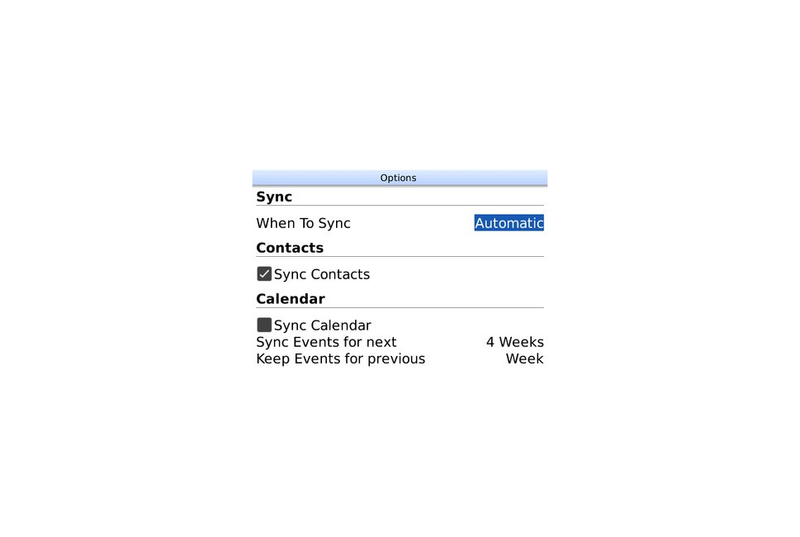 Once the Google Sync app is installed, open it, input your Gmail account details, check the app settings to ensure that both Contacts and Calendar are checked, and press Sync Now. If you don’t intend to keep using the BlackBerry, you can go ahead and power it down for the final time after sync has completed, as you won’t need it anymore. You can and should also install the desktop version of Google Sync so that your new phone can remain automatically synced to your Outlook calendar--no docking or wires needed. Once this sync is complete, open the Calendar app on your Android phone, and see what you think! Finally, you’re going to need some replacements for your favorite BlackBerry applications. If you're interested in handling your office documents on the go, check out our basic guide to managing documents on your Android phone. You might also like the Evernote app for keeping track of memos and automatically syncing them to a desktop computer. Unfortunately, you can’t use BlackBerry Messenger on Android, but you can install Skype from the Google Play store (the equivalent of BlackBerry App World); Google also provides its own replacement, called Talk, which automatically makes you available for chat with anyone you’ve corresponded with via Gmail. If that doesn’t sound like something you want, just open the Talk app, go to the Settings menu, and uncheck Automatically sign in. You should try to use your Android phone on wireless networks when they’re available, such as at home, in order to save on data consumption and battery life (if you weren’t already in the habit of doing so with your BlackBerry). On most Android phones, the Wi-Fi configuration is somewhat unhelpfully buried under Menu, Settings, Wireless and Networks, Wi-Fi Settings (where you’ll probably want to uncheck Network notification so that your phone will stop shouting about new networks being available). It’s easy to set up, though: Just click on the network you want, and enter the password. After that, all that’s left is for you to get used to the Android interface. You’ll probably find that it’s quite nice--tapping and dragging are both very intuitive, and judicious use of the Back button at the bottom of your device will help you speed through menus. To access the notifications at the top of your screen (one of the best features of Android), simply drag them down and tap them individually. Congratulations on your move, and good luck!